Aim: To investigate the added-value of using CBCT in the orthodontic treatment method of maxillary impacted canines and treatment outcome. Materials and Methods: The sample consisted of 118 treated patients. 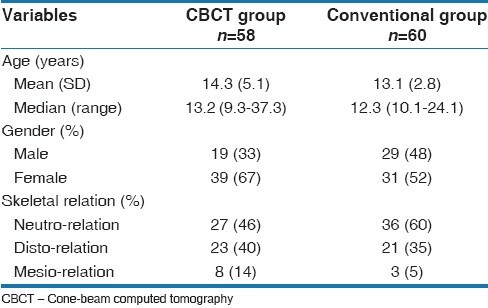 The CBCT group (n = 58) (39 females/19 males with the mean age of 14.3 years) included those with conventional treatment records consisting of panoramic and cephalometric radiographs, intra-and extra-oral photographs, and dental casts and complemented with a CBCT scan for additional diagnostic information. The conventional group (n = 60) (31 females/29 males with mean age 13.1 years) included those with similar conventional treatment records but without CBCT imaging. Results: There were significant differences in the canine-related variables between both groups. The CBCT group had the higher level of difficulty and more severely displaced canines when compared with the conventional group. However, no significant difference was found between groups either in the number of treatment methods used or in the use of interceptive methods combined with other treatment modalities or choice of extraction versus non-extraction. In terms of treatment success and interval duration, no significant differences were found. However, treatment duration was significantly (4 months) shorter in the CBCT group compared with the conventional group (P = 0.023). Conclusion: CBCT has been used in cases with more severe symptoms of maxillary canine impaction. The use of CBCT improved the diagnostic capabilities and improved the chances of success in the more difficult cases to a level similar to that of simpler cases treated on the basis of 2D information. Early prediction is key for success, and failure of early diagnosis has been recognized as a problem. The accurate location of impacted canines and determining their relationship to adjacent incisors and anatomical structures is the part of the diagnostic process and is essential for successful treatment. This required information can be partially obtained from conventional two-dimensional radiographs. Conventional radiological imaging has been used in daily practice as the first step in examining the impacted canine. Cone-beam computed tomography (CBCT) with reduced radiation doses compared with those of medical CT, whilst offering three-dimensional (3D) imaging capability for displaying head and neck structures in detail has been introduced. The rapid development of CBCT scanning combined with 3D rendering techniques produces high-resolution images that have been proven to be useful for the diagnosis of impacted canines, treatment planning, and the identification of associated complications, such as root resorption, in adjacent incisors. CBCT overcomes the limitations of conventional two-dimensional (2D) imaging. ,, Therefore, the aim of this retrospective study was to evaluate the outcomes of the orthodontic treatment method and treatment with or without the presence of complementary CBCT imaging. This investigation was a retrospective study based on the treatment records of patients who were treated by postgraduate residents at the Department of Oral Health Sciences, Orthodontics KU Leuven and Dentistry, University Hospitals Leuven, Leuven, Belgium. All patients were non-syndromic and selected according to the following inclusion criteria: (1) Each patient had to present at least one impacted maxillary canine; and (2) Complete orthodontic diagnostic pre- and post-treatment dental records had to be present (initial records and final records). The conventional treatment records included panoramic and cephalometric radiographs, intra- and extra-oral photographs, and dental casts. CBCT images were included if present. The sample consisted of 118 patients treated consecutively. The diagnosis of impacted canines was determined from the patients' dental records. For the purpose of this study, the patients were divided into two groups. 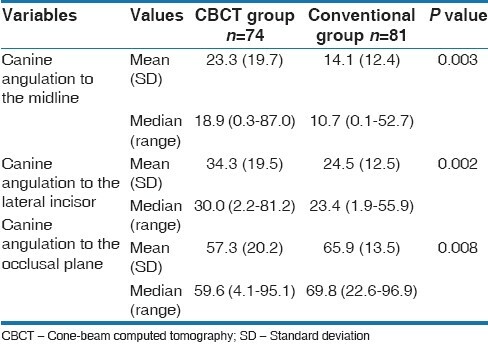 The CBCT group (n = 58) (39 females/19 males with the mean age of 14.3 years) included those with conventional treatment records and complemented with a CBCT scan for additional diagnostic information. The conventional group (n = 60) (31 females/29 males with the mean age of 13.1 years) included those with similar conventional treatment records but without CBCT imaging. In all patients, the CBCT images were obtained at the same time as conventional radiographs or within a maximum interval of 2 weeks before the treatment start. All patients were referred for a CBCT examination because 3D visualization of the canine relative to the adjacent teeth was clinically indicated to perform the treatment plan. The digital panoramic and lateral cephalometric radiographs were taken with two systems: A Cranex TOME ® (Soredex, Helsinki, Finland) and the Veraviewepocs 2D ® (J. Morita, Kyoto, Japan). The exposure parameters of Cranex TOME ® were 15 s, 65 kV, and 15 mA. The Veraviewepocs 2D ® panoramic and lateral cephalometric images were taken with a high-resolution CCD sensor (32-bit microprocessor) (J. Morita, Kyoto, Japan) with exposure parameters 7.4 s, 64 kV, and 8.9 mA. CBCT scans were carried out with two CBCT systems. The first one involved a 3D Accuitomo-XYZ Slice View Tomograph (J. Morita, Kyoto, Japan) with a voxel size of 0.125 mm (FOV 30 × 40 mm). Parameters included a tube voltage of 80 kV, a tube current of 3 mA, and an exposure time of 18 s. The second system was a SCANORA ® 3D CBCT (Soredex, Tuusula, Finland) with a voxel size of 0.2 mm (FOV 75 × 100 mm), tube voltage of 85 kV, current of 10 mA, and an exposure time of 3.7 s.
The treatment protocol was standard for all patients in both groups, using modified standard edgewise appliances with conventional 0.018-inch bracket slots (GAC Dentsply, NY, USA). Treatment methods that were used either separately or in combination: (A) Interceptive treatment, (B) Extraction or non-extraction, (C) Removable extrusion appliance, and (D) Functional appliance. Successful treatment was recorded if the treatment goals were achieved by the alignment of the impacted canine into the normal position and the case resulted in stable occlusion. Total treatment duration obtained from dental records. The interval duration was calculated as the time between the start of the treatment and the start of orthodontic traction on the impacted canine for extrusion purposes. Canine crown position in relation to adjacent teeth: Palatal, buccal, or in the arch line. Type of canine impaction: Partial vertical impaction, complete vertical impaction, and complete horizontal impaction. Canine root development was assigned to one of two categories: Incomplete root development, or complete root development. The presence of abnormalities, such as mesiodens, peg-shaped lateral incisor, agenesis of permanent teeth, and impaction of other permanent teeth. The mesio-distal space available for the canine was assigned to one of three categories, modified from Cernochova et al.,  as follows: (A) Lack of space for the erupting canine, (B) complete loss of space, and (C) sufficient space available for the canine. The vertical location of the maxillary canine crown was assigned to one of five categories, modified from Power and Short  [Figure 1]. The canine overlap with adjacent teeth (sector) was assigned according to one of six categories, modified from Ericson and Kurol  [Figure 2]. 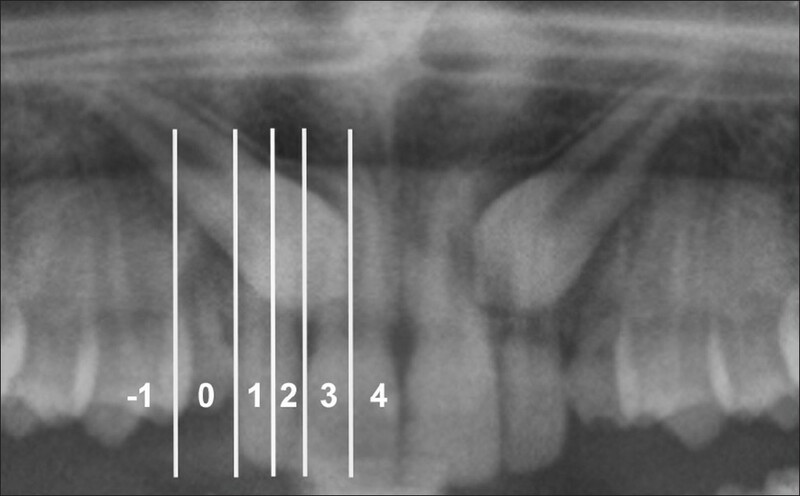 Permanent maxillary canine angulations: Three angles were measured on the panoramic radiographs: (A) Canine angulation to the midline, (B) canine angulation to the lateral incisor, and (C) canine angulation to the occlusal plane [Figure 1]. The surgeries performed during treatment were recorded. Complications during treatment included: Canine root resorption, canine extraction, extraction of the lateral incisor, poor oral hygiene, and poor patient cooperation. The post-treatment presence and severity of root resorption of lateral and/or in the central incisors were recorded. The Fisher's Exact, Mann−Whitney U, and Trend tests were used to compare the two groups. A propensity score (PS) was used to balance differences between groups. The PS was defined as the conditional probability of using 3D given the patient and canine-level variables. This probability was determined according to a multivariable logistic regression model wherein several covariates were considered as predictors. Covariates were those that differed (P < 0.10) between groups in a univariate setting. The Area Under the Curve (AUC) is known as the C index of the propensity model, which reflects the amount of overlap in differences between groups (0.5 = no discrimination, 1 = perfect discrimination and no overlap at all). Moreover, the higher the AUC, the less meaningful the between-group comparison. For evaluation of the differences between groups, corrected for imbalances, the propensity score (PS) has been used as a covariate in regression models. Linear regression models are used for continuous outcomes (treatment duration and interval duration). Risk ratios for binary outcomes were obtained from a binomial regression model with a log-link function. Linear regression models were used for treatment outcomes. A robust variance estimate (GEE) was used for outcomes which can vary within a patient with a bilateral impaction. In addition, the receiver operating characteristic analysis (ROC), based on the empirical distribution to derive the optimal cutoff point for the canine angulation measurements, was used to discriminate between groups. The optimal point was defined as the value that maximizes the Youden index (the sum of sensitivity and specificity minus one). P-values smaller than 0.05 were considered significant. All analyses were performed with SAS software, version 9.2, of the SAS System for Windows (Copyright© 2002, SAS Institute Inc., Cary, NC, USA). [Table 1] presents descriptive statistics for the general evaluation variablesý of the two patient groups. The patients' ages and genders were significantly different between the two groups (P = 0.05). The CBCT patients were older, and there were more female patients than in the conventional group. 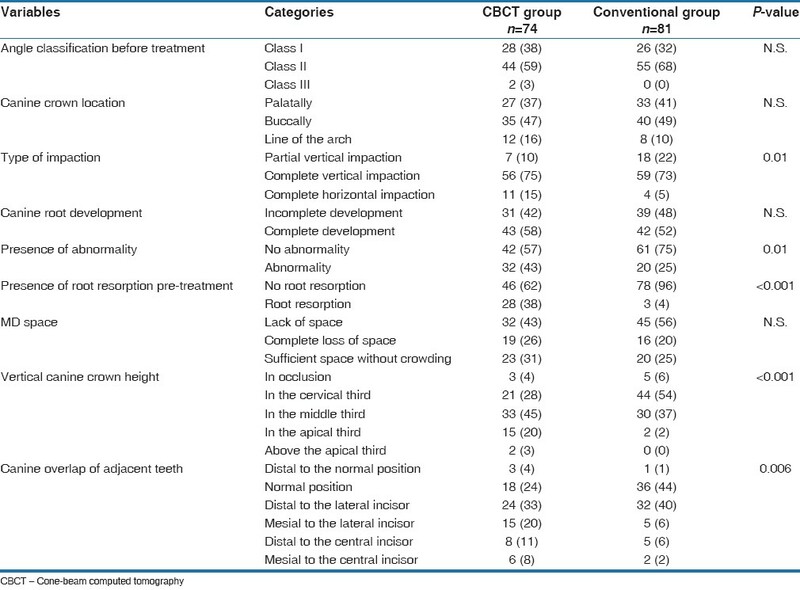 In the CBCT group, the following canine-related variables were noted significantly more frequently: Complete horizontal impaction, canine crown location in the apical third or above the adjacent teeth and mesially located to the lateral incisor root [Table 2]. The canine angulations to the midline as well as to the lateral incisor were increased, and decreased to the occlucal plane [Table 3]. The optimal cutoff points for canine angulation measurements were used to discriminate between groups: 16.4 degrees to the midline, 33.2 degrees to the lateral incisor, and 66.7 degrees to the occlusal plane. 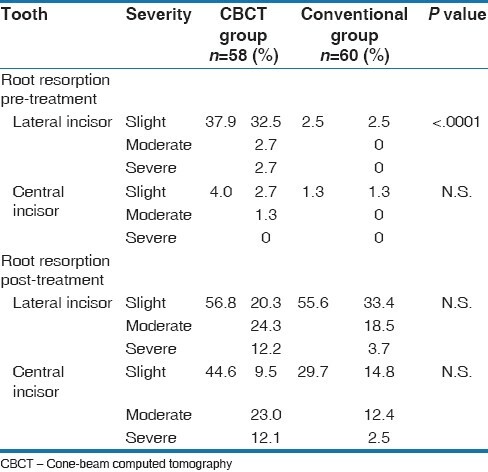 Moreover, the presence of abnormalities and the pre-treatment lateral incisor root resorption were higher in the CBCT group [Table 2]. The non-randomized characteristics of the study showed that the between-group patient and canine variables differed, especially as the choice for the use of CBCT as a diagnostic tool was related to the anticipated level of diagnostic difficulty and complexity or to treatment planning needs. This yielded a potentially biased estimate of the differences in treatment methods and outcomes between groups. Therefore, the PS (the probability) for CBCT was used as a covariate in regression models to correct the imbalance. The AUC of this model quantified the amount of overlap in variables between groups and was equal to 0.755 (95% CI: 0.68-0.83). A reasonable amount of overlap between the CBCT and conventional groups was found to facilitate the comparison of treatment methods and outcomes. There was no difference between groups in either the number or choice of treatment methods used, i.e. interceptive methods combined with another treatment modalities such as choice of extraction vs. non-extraction, or type of appliance used. Both groups showed almost identically successful treatment rates (respectively, 90 and 87%). 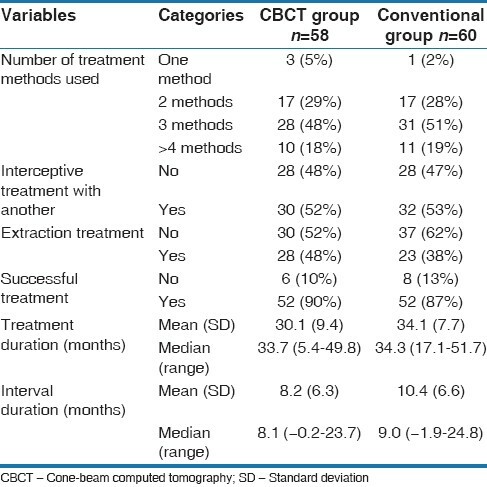 Treatment duration was significantly (4 months) shorter in the CBCT group compared with the conventional group (P = 0.023), and the interval between the start of treatment and the start of traction was slightly shorter (2.6 months), but not significantly different, in the CBCT group [Table 4]. 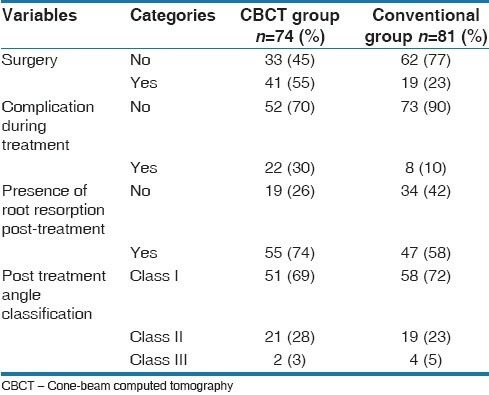 However, the surgical interventions needed during treatment and the incidence of complications as well as the incidence of root resorption post-treatment were higher in the CBCT group, but not significantly different after imbalances were corrected [Table 5]. The presence and the severity of root resorption detected in lateral and central incisors pre- and post-treatment are shown in [Table 6]. The relative risks for the incidence of complications, need for surgical intervention, and root resorption are shown in [Table 7]. The relative risk for the increased incidence of complications during treatment was not negligible [RR = 1.93 (95%CI: 0.80; 4.66)]. Orthodontic treatment methodology for impacted canines depends on various factors, such as location of the impacted canine in the dental arch relative to adjacent incisors, the distance from the occlusal plane, canine crown overlaps, and canine angulations. , These variables are also used as predictors of the duration of orthodontic treatment until alignment of the canine is achieved. , In the present study, radiographic variables were evaluated in pre-treatment panoramic and lateral cephalometric radiographs, and by CBCT if it was available. As both groups had panoramic images, the angulation measurements, overlaps, and vertical canine height determinations were performed on panoramic radiographs rather than on CBCT images. Linear measurements were not performed on panoramic radiographs, due to the amount of distortion and magnification. ,, Therefore, overlap with adjacent teeth and vertical height were used instead of linear measurement to locate the impacted canine. The mean treatment duration in the CBCT group was 32.9 months (SD, 9.3 months), and for control group, 34.1 months (SD, 7.7 months). In our study, all patients were treated by postgraduate residents under supervision as a part of their clinical training, which took longer compared with treatment by an experienced orthodontist. All clinical supervisors were dedicated to the treatment of impacted canines and had at least 5 years of clinical experience in all aspects of orthodontic treatment. The second reason for differences could be that the treatment times were recorded as the period from the date of treatment began to the date it ended (start of the retention phase), and not from the date of surgical exposure to the date of alignment correction. Treatment duration was found to be 4 months shorter in the CBCT group. Defining the exact location of the impacted canine in three dimensions is crucial in treatment planning and provides good decision-making that may allow for direct access or traction, and less invasive and less time-consuming treatment. Moreover, the accurate 3D visualization of the impacted canine helped the treating orthodontist move the canine into normal occlusion without further delay. A randomized clinical trial cannot be performed in this kind of study because it is unethical to expose patients randomly to CBCT without clinical or radiologic justification. Our concern was that patients with impacted canines should not be exposed to additional radiation for the sole purpose of study. Further studies, both randomized and prospective should be performed to verify treatment outcomes and the benefits of using CBCT in cases of impacted canines. CBCT has been used in cases with more severe symptoms of maxillary canine impaction. CBCT may reduce the duration of treatment. The use of CBCT improved the diagnostic capabilities of the orthodontist and improved the chances of success in the more difficult cases to a level similar to that of simpler cases treated on the basis of 2D information. 1. Bishara SE. Impacted maxillary canines: A review. Am J Orthod Dentofacial Orthop 1992;101:159-71. 2. Ericson S, Kurol J. Radiographic examination of ectopically erupting maxillary canines. Am J Orthod Dentofacial Orthop 1987;91:483-92. 3. Warford JH, Jr., Grandhi RK, Tira DE. Prediction of maxillary canine impaction using sectors and angular measurement. Am J Orthod Dentofacial Orthop 2003;124:651-5. 5. Alqerban A, Jacobs R, Fieuws S, Willems G. Comparison of two cone beam computed tomographic systems versus panoramic imaging for localization of impacted maxillary canines and detection of root resorption. Eur J Orthod 2011;33:93-102. 6. Liu DG, Zhang WL, Zhang ZY, Wu YT, Ma XC. Localization of impacted maxillary canines and observation of adjacent incisor resorption with cone-beam computed tomography. Oral Surg Oral Med Oral Pathol Oral Radiol Endod 2008;105:91-8. 7. Walker L, Enciso R, Mah J. Three-dimensional localization of maxillary canines with cone-beam computed tomography. Am J Orthod Dentofacial Orthop 2005;128:418-23. 8. Ericson S, Kurol J. Incisor root resorptions due to ectopic maxillary canines imaged by computerized tomography: A comparative study in extracted teeth. Angle Orthod 2000;70:276-83. 9. Cernochova P, Krupa P, Izakovicova-Holla L. Root resorption associated with ectopically erupting maxillary permanent canines: A computed tomography study. Eur J Orthod 2011;33:483-91. 10. Power SM, Short MB. An investigation into the response of palatally displaced canines to the removal of deciduous canines and an assessment of factors contributing to favourable eruption. Br J Orthod 1993;20:215-23. 11. D'Agostino RB, Jr. Propensity score methods for bias reduction in the comparison of a treatment to a non-randomized control group. Stat Med 1998;17:2265-81. 12. Spiegelman D, Hertzmark E. Easy SAS calculations for risk or prevalence ratios and differences. Am J Epidemiol 2005;162:199-200. 13. Stewart JA, Heo G, Glover KE, Williamson PC, Lam EW, Major PW. Factors that relate to treatment duration for patients with palatally impacted maxillary canines. Am J Orthod Dentofacial Orthop 2001;119:216-25. 14. Iramaneerat S, Cunningham SJ, Horrocks EN. The effect of two alternative methods of canine exposure upon subsequent duration of orthodontic treatment. Int J Paediatr Dent 1998;8:123-9. 15. Zuccati G, Ghobadlu J, Nieri M, Clauser C. Factors associated with the duration of forced eruption of impacted maxillary canines: A retrospective study. Am J Orthod Dentofacial Orthop 2006;130:349-56. 16. Schubert M, Baumert U. Alignment of impacted maxillary canines: Critical analysis of eruption path and treatment time. J Orofac Orthop 2009;70:200-12. 17. Fleming PS, Scott P, Heidari N, Dibiase AT. Influence of radiographic position of ectopic canines on the duration of orthodontic treatment. Angle Orthod 2009;79:442-6. 18. Szarmach IJ, Szarmach J, Waszkiel D. Complications in the course of surgical-orthodontic treatment of impacted maxillary canines. Adv Med Sci 2006;51 Suppl 1:217-20. 19. Becker A, Smith P, Behar R. The incidence of anomalous maxillary lateral incisors in relation to palatally-displaced cuspids. Angle Orthod 1981;51:24-9. 20. Haney E, Gansky SA, Lee JS, Johnson E, Maki K, Miller AJ, et al. Comparative analysis of traditional radiographs and cone-beam computed tomography volumetric images in the diagnosis and treatment planning of maxillary impacted canines. Am J Orthod Dentofacial Orthop 2010;137:590-7. 21. Botticelli S, Verna C, Cattaneo PM, Heidmann J, Melsen B. Two- versus three-dimensional imaging in subjects with unerupted maxillary canines. Eur J Orthod 2011;33:344-9. 22. Wriedt S, Jaklin J, Al-Nawas B, Wehrbein H. Impacted upper canines: Examination and treatment proposal based on 3D versus 2D diagnosis. J Orofac Orthop 2012;73:28-40. 8 Is there a consensus for CBCT use in Orthodontics?